Excess sagging fat and skin are removed and the procedures can improve a dimpled, irregular skin surface, which is commonly known as cellulite. How do I know if a body lift is right for me? Body contouring is primarily for people who have been overweight, and had a significant reduction in their weight, leaving excess skin. It is ideal for people who have reached their ideal body weight. If you have experienced massive weight loss, and find yourself limiting your wardrobe choices, feeling inhibited in front in intimate partners or covering up at the beach – and provided you have realistic expectations, body lift surgery might be for you. Body lift surgery is not recommended for people who are morbidly obese. Body contouring surgery involves extensive scars, which is why it is important to choose a qualified plastic surgeon, to ensure the best techniques and approach is taken to ensure scars are as minimal as possible. In some cases, scars can be strategically placed to blend in with the body’s natural folds or by clothing (see before and after images, right). 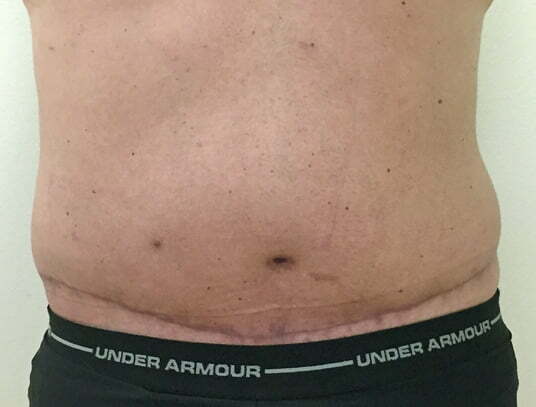 The length of the incision will vary depending upon the location and the amount of fat being removed. Dr Sharp and his team offer a proven pre and post operative skin optimisation program that supports you in maintaining healthy skin quality throughout, and after, your surgical journey to reducing long term scarring. Be sure to ask questions. To help, we have prepared a checklist of questions to ask your body lift surgeon that you can take with you to your consultation. Healthy nutrition and regular physical activity, including core strength exercises and practicing good posture, are integral to obtaining and maintaining optimal long-term results. 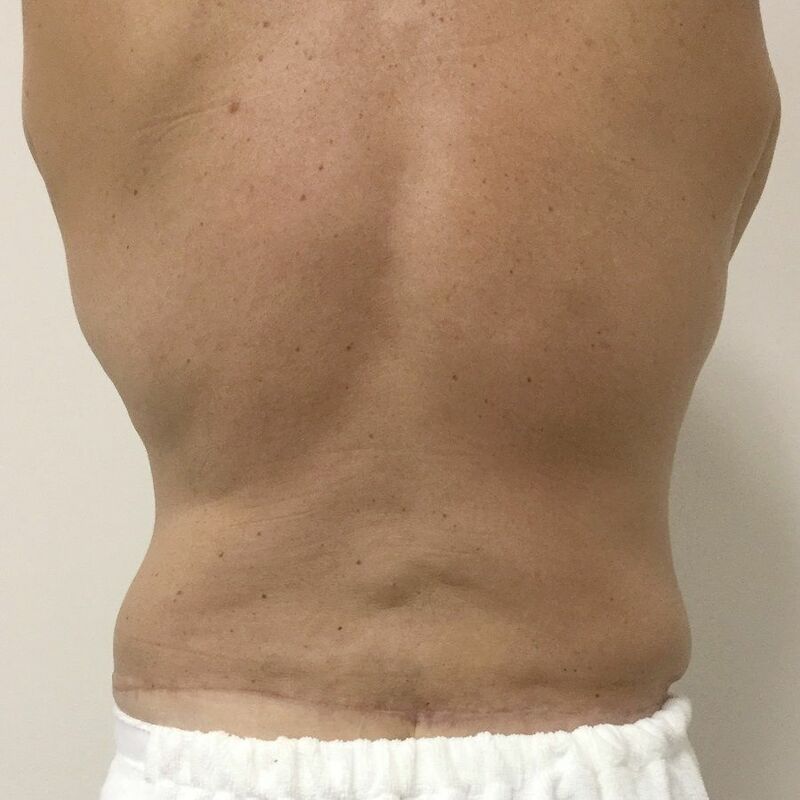 Dr David and his team can also medically support your results after body lift surgery, through the nonsurgical treatments available at his practice, including SculpSure; a revolutionary nonsurgical fat reduction treatment that reduces stubborn pockets of residual fat by up to 24% in only 25 minutes, while tightening the skin. The treatment is comfortable, quick and has no downtime or after-treatment pain. Bringing a list of questions along to your initial consultations, and being honest with your surgeon regarding your lifestyle and post-operative plans is integral to having a healthy recovery and good outcome. Remember, body lift surgery is not for everyone. It involves a significant recovery period and requires strict adherence to your surgeon’s advice. It’s normal to feel both nervous, and an excited sense of anticipation when planning your tummy tuck. Dr Sharp takes the time to ensure you have as many consultations as you require, to ensure your treatment is customised to suit your body and expectations – and address any concerns you may have. Pregnancy brings the greatest of gifts, but it can also take away the body you once had. Rapid weight gain, and then weight loss - as well as the general stretching caused by an expanding stomach and breastfeeding, can have an impact on body image, and in some cases, comfort and hygiene. Post-pregnancy body lift typically involves a combination of abdominoplasty, liposuction and breast lift. However, it can include thigh and arm lift surgery as well. Due to the transformational aspects of this procedure, it is important to choose a surgeon that understands your goals, lifestyle and makes you feel informed, supported and respected throughout this journey. No woman should feel pressured to change her body after having babies; neither by other people or social expectations in general. Everyone’s body recovers at a different pace, and anybody that has produced life is beautiful. This procedure simply empowers women to have a choice about how they want their bodies to look, if their new post-baby body sits at odds with how they would like to look or feel. Dr Sharp has a special interest in post-pregnancy transformations - also known as ‘mummy makeover’ surgery. If you are planning future pregnancies, Dr Sharp recommends that you postpone having a body lift until you think you have completed your family. Click here to read more about tummy tuck and breast surgery options for restoring body shape and condition. Does body contouring remove stretch marks? Body contouring does not correct stretch marks, however, some of these might be removed or reduced if they are located on the excess skin that is removed. Dr Sharp’s clinic offers a range of safe, skin therapies that have been scientifically proven to reduce stretch marks – without surgery, needles or downtime. If you are concerned about stretch marks, call 3202 4744. Body contouring surgery is performed under a full general anaesthetic. A specifically selected range of medications are administered during the surgery to ensure your post-operative comfort. Dr Sharp works with an experienced team of friendly and skilled anesthetists. Following your surgeon’s instructions is essential to the success of your surgery. Abdominal wall muscles can become lax or separated due to pregnancy or aging. When toned, the rectus abdominus muscles join to create a flat stomach or ‘six pack’ shape. When repeatedly stretched, they can sometimes sit far apart from where they should ideally meet in the middle (called diastasis or diverication of rectus). This is corrected using permanent stitches, which pulls the muscles together for a firmer abdomen and narrower waist. Sometimes the laxity of the lateral abdominal muscles (obliques) also requires permanent sutures to create an ideal shape (called muscle plication). Numbness or sensory changes around the scar and across the abdomen. Some factors, such as weight, lifestyle or health problems can increase the chance of a complication occurring. Dr David will take time to learn about your potential risk factors during your pre operative consultations, and will determine if they are relevant to your surgery. If you have any concerns regarding your body lift and the associated risks, feel free to book additional pre operative consultations with Dr Sharp. Obvious benefits include the improved sense of body confidence that comes with having a flatter stomach – and the wider selecting of clothing and swimwear available to suit your new body shape. The procedure will lead to improved abdominal tone, enhancing the appearance of the abdominal wall muscles. Functionally, repairing the separation of the rectus abdominis muscles will also result in an increase in core strength. If your ‘apron’ of skin was hanging over your pants or rubbing on the skin underneath, you will also no longer have to worry about chaffing, skin infections, dermatitis in this region. Some patients also notice improved abdominal and pelvic muscle function, which can help them develop better control over defecation and urination – and help with stress incontinence. In the long term, patients may also notice a reduction in back pain and improved posture. Under some circumstances, body lift surgery might be classified as medically required, and therefore have a Medicare item number. If so, you might be eligible to claim a rebate from Medicare and your private health fund. In these cases, after a consultation with Dr Sharp, an application for pre-approval can be lodged with your private fund/Medicare to assist with forward planning your out of pocket expenses. After your consultation with Dr Sharp, if there’s a possibility that your surgery meets Medicare’s criteria, you will be provided with an item number. We recommend you contact your health insurance provider and ask them if you are covered for plastic surgery, particularly citing the item number provided. It is important to understand that, in the case of complications or revision surgery, the cost of your body lift might extend to future surgical procedures and hospitalisations. We encourage patients to think about how they would fund further treatment beyond the immediate costs expected. Your result will last forever (or at least as long as you do), provided you generally maintain your operative weight and don’t sustain injuries or undergo further abdominal surgery. Pregnancy and substantial weight gain are the two most common reasons why abdominoplasty results don’t last.